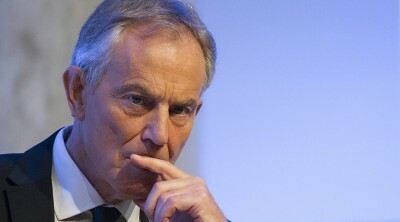 Tony Blair Is Sorry, A Little. “An Honest Mistake” or War Crimes? While George W. Bush is apparently proud of everything he’s ever done, Tony Blair came dangerously close to facing reality this weekend when he admitted there were “elements of truth” in the view that the 2003 invasion of Iraq was the principle cause of the rise of ISIS (among other catastrophic results of that invasion). “I find it hard to apologize for removing Saddam. I think, even from today in 2015, it is better that he’s not there than that he is there,” Blair said. You have to hand it to Blair, for a global spreader of democracy through death, he boldly ignores any question of whether the people of Iraq agree with him. They do not. Back in 2004, the BBC bragged that it could get 49% of Iraqis (“almost half”!) to say that the invasion had been “right.” In 2007, an Iraqi poll found that 90% of Iraqis believed they’d been better off before the invasion. In 2011, a U.S. poll found that many more Iraqis thought they were worse off, than thought they were better off, because of the invasion. Perhaps those ignorant Iraqis just can’t see how much better off they are. That would explain why they had to be invaded and occupied in the first place. But a careful examination of the death, injury, trauma, environmental damage, infrastructure loss, and societal devastation brought to Iraq by Bush, Blair, and company establishes the war on Iraq from 2003 forward as one of the world’s worst events. Clearly the hell created in Libya in 2011 does not rival the damage done to Iraq. The hell being created in Syria does begin to rival Iraq, but it has been steadily worsened by Western efforts to overthrow the government, not by Western restraint. For that matter, it has been seriously worsened by the previous invasions of Iraq and Libya, as well as by the steady arming of the region with U.S. weapons over the past several years. Tunisia just brought home a Nobel Peace Prize in large part due to having a couple of lucky breaks, possibly related to each other. First, Tunisia sits on less oil and gas and in the way of fewer oil and gas pipelines. Second, it has received far less “help” from U.S. and European militaries. For the most part, the Pentagon and U.K. have done to Tunisia what Tony Blair literally cannot conceive of doing in Iraq, Libya, or Syria, namely, left it the heck alone, as it found its own way to better government. But, one might ask, how can the West just stand by as brutal governments abuse their people? Well, the West never does just stand by. Occasionally it overthrows those governments, making everyone even worse off. Far more often it arms, funds, and supports those governments — as in Saudi Arabia, Yemen, Bahrain, Jordan, Egypt, Israel, the new Iraq, etc. — keeping everyone in their current state of suffering. And there we see why Tony Blair doesn’t consider the views of Iraqi people before declaring that “it is better that he’s not there than that he is there.” From the point of view of Western weapons companies, Western oil companies, Western friends and associates of Tony Blair, he’s perfectly right. It is better that all those people were killed and the region thrown into chaos for many years to come. One must adopt a radically different perspective to hear the meaning when I say, It is better that Jeremy Corbyn leads the Labour Party, and that even CNN now tries to ask Tony Blair to answer for his crimes.